Two recent papers, Zanna et al. (2019) (hereafter ZKGIH19) and Gebbie & Huybers (2019) (hereafter GH19), independently reconstructed ocean heat content (OHC) changes prior to the instrumentally-based records (which start ~1950). The goals (and methodologies) of the two papers were quite different – ZKGIH19 investigated regional patterns of ocean warming and thermal sea level rise, while GH19 analyzed the long-term memory of the deep ocean – but they both touch on the same key questions of climate forcing and response. As dark nights draw in, the venerable contrarians at the GWPF are still up late commissioning silly pseudo-rebuttals to mainstream science. The latest, [but see update below] which no-one was awaiting with any kind of breath, is by Dr. Ray Bates (rtd.) which purports to be a take-down of the recent #SR15 report. As Peter Thorne (an IPCC author) correctly noted, this report is a “cut-and-paste of long-debunked arguments”. I’ve grown a little weary of diving down to rebut every repetitive piece of nonsense, but this one has a few funny aspects that make it worthwhile to do so. When they go low, we go “sigh…”. Scientists predicted in the 1980s that a key fingerprint of anthropogenic climate change would be found in the ocean. If they were correct that increases in greenhouse gases were changing how much heat was coming into the system, then the component with the biggest heat capacity, the oceans, is where most of that heat would end up. I, with the other co-authors of Resplandy et al (2018), want to address two problems that came to our attention since publication of our paper in Nature last week. These problems do not invalidate the methodology or the new insights into ocean biogeochemistry on which it is based, but they do influence the mean rate of warming we infer, and more importantly, the uncertainties of that calculation. Does global warming make tropical cyclones stronger? Friday marks the official start of the Atlantic hurricane season, which will be watched with interest after last year’s season broke a number of records and e.g. devastated Puerto Rico’s power grid, causing serious problems that persist today. One of us (Mike) is part of a team that has issued a seasonal forecast (see Kozar et al 2012) calling for a roughly average season in terms of overall activity (10 +/- 3 named storms), with tropical Atlantic warmth constituting a favorable factor, but predicted El Nino conditions an unfavorable factor. ?Meanwhile, the first named storm, Alberto, has gone ahead without waiting for the official start of the season. Through two new studies in Nature, the weakening of the Gulf Stream System is back in the scientific headlines. But even before that, interesting new papers have been published – high time for an update on this topic. The basic facts about the global increase of CO2 in our atmosphere are clear and established beyond reasonable doubt. Nevertheless, I’ve recently seen some of the old myths peddled by “climate skeptics” pop up again. Are the forests responsible for the CO2 increase? Or volcanoes? Or perhaps the oceans? 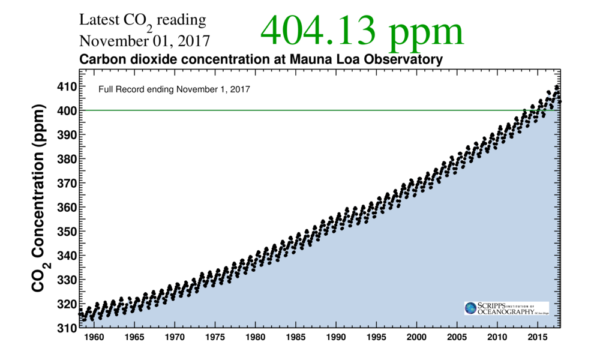 Since the beginning of industrialization, the CO2 concentration has risen from 280 ppm (the value of the previous millennia of the Holocene) to now 405 ppm. This increase by 45 percent (or 125 ppm) is completely caused by humans. The CO2 concentration is thus now already higher than it has been for several million years. The additional 125 ppm CO2 have a heating effect of 2 watts per square meter of earth surface, due to the well-known greenhouse effect – enough to raise the global temperature by around 1°C until the present.